Successfully Added Huawei Mate 8 Smartphone - 6 Inch Screen, Android 6.0, Kirin 950 Chipset, 3GB RAM, Fingerprint Sensor, 4G, NFC, OTG (Silver) to your Shopping Cart. The Mate 8 smartphone from Huawei should need no introductions, this is one of the Chinese phone manufacturers flagship models and as such packs an impressive performance, some expert cameras and a large screen into an attractive package that's not to be missed. Containing a potent chipset the Kirin 950 comes with two sets of ARM’s Cortex A53 and A72 cores, clocked at 1.8 and 2.53GHz respectively, when you add the 3GB of RAM to this you inevitably end up with a performance that is top notch and can handle games and just about any other demanding task without any hassles. The operating system on this Mate 8 is known as the EMUI 4.0, like other brands Huawei add a touch of their own flavor to the operating system in what it calls the Emotion UI. This version is based on the Android 6.0 Marshmallow, and while it comes with all the standard features such as Doze ( automatic battery saving ), Now on Tap and voice commands with Ok Google the EMUI interface brings with it some nice customizations options. You can change the screen layout along with adding effects to menus, transitions and notification too, so you'll be able to get the phone looking just the way you like. For some anything less than 6 inches just doesn't cut it. When it comes to games and video entertainment the bigger the better. With it's 6-inch full HD display the Huawei Mate 8 Android phone is bigger than most and offers up a respectable 368PPI pixel density so you can watch videos and play games in great detail. Unlike some rival phones with 2K resolutions the Mate 8 opts for a balance here so as you get a longer battery life while still enjoying great resolutions. A fingerprint sensor is located under the rear facing camera and brings quick easy authentications for unlocking the phone. With NFC you can also use this for secure mobile payments so your phone can now double as a wallet as well. As you would expect from flagship device 4G connectivity is a given. But with the Mate 8 large screen phone you get two SIM card slots and can have dual standby letting you run two numbers at the same time. If you want you can exchange the second SIM card slot for use with a micro SD card and this will bring you the option of up to 128GB of extra storage. Packing a 4000mAh battery this Android smartphone can run for many hours on end bringing you a day's worth of performance from a single charge. Considering its large screen and powerful processor this is a fairly impressive feat. The slim battery that's tucked away inside this phone doesn't add much extra to the bulk so it's able to remain relatively thin. With its slightly curved back the Mate 8 is more comfortable to hold than most of those flat backed devices and this is a welcome design feature given the phones larger dimensions. The craftsmanship is also noteworthy with a metal finish and curved edges its brings a premium feel to match the performance making it one of the best android phones for your money. The Mate 8 cell phone offers a 16MP camera with a f/2.0 aperture so you can enjoy better results in low light, there is also a front-facing 8MP camera so you'll be able to snap some impressive images with this setup. 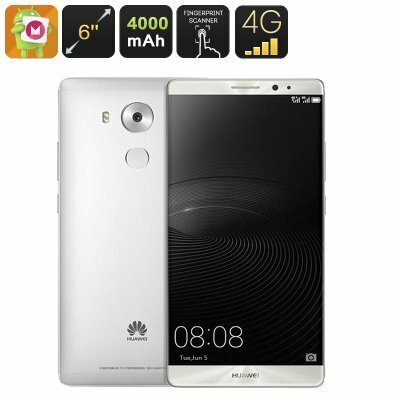 The Huawei Mate 8 Android Phone comes with 12 months warranty, brought to you by the leader in electronic devices as well as wholesale Android phones and accessories..